Couponing is a practice that can save you lots of money on your monthly grocery bill. While couponing isn’t for everyone, I’d recommend you at least give it a try for a month. If you do want to try it, one of the first things you’ll ask yourself is how do I get coupons? The most common places to find coupons are in newspapers and magazines. But there are easier ways to get coupons, especially since fewer people are paying for a newspaper subscription these days. You can always find printable coupons at sites like Coupons.com and Redplum. But what if you want to get free coupons by mail? In this article, I’m going to show you how to get free coupons in the mail from your favorite brands. Pro-tip: If you’re looking for ways to save big on groceries, check out Ibotta. I’ve saved over $389 on groceries with it so far. Read my review of Ibotta here. The best way to get free coupons mailed to you is to contact the company itself. Companies love to hear feedback about their product. If you send them an honest email with positive OR negative feedback it’s likely that they’ll send you “thank you” or “please give our product a second try” coupons straight to your mailbox. Contacting companies for coupons sounds like a lot of work and of course, sometimes your efforts will be for nothing. But when you do find a company that sends you coupons, the coupons will usually be of high value and well worth the effort spent to receive them. For this method to work you have to contact the company either through email or through a contact form on their website. Tweeting at them or posting on one of their Instagram posts is not going to work. Most companies will have a link to their contact information in the footer of their website. Be polite – Even if you’re sending negative feedback if your goal is to receive coupons from the company, it’s best to always remain civil and professional. Be specific – Praise or critique a specific product. For example, don’t tell a company that you enjoy their ice cream. Tell them the exact flavor you prefer best. Provide details – Make you tell the company exactly what you love (or hate) about their product in as specific detail as possible. If you’re sending a complaint email, make sure to include the UPC code of the product, the date you purchased the product, and the exact issue you had with it. Not sure what companies to contact? The best way to find a list of companies to get coupons from is to go through your pantry, bathroom, and laundry room and write down all the different products you buy on a regular basis. Make a note of companies that make multiple products you buy. Those companies will provide the best return on investment for contacting them. Companies use social media to run promotions all the time. Very often they’ll have a survey or promotion for new products or to gather customer feedback. In return for filling out these promotions, they’ll often email or send you coupons in the mail. If you followed the instructions in the previous step you should have a huge list of all the companies whose products you own. Go through and follow each of these company’s Facebook pages. You don’t have to like each Facebook page if you don’t want. Just check their page periodically for promotions and coupons. Buying coupons may sound odd. Why spend money to save money? But sites like Klip2Save and theCouponClippers offer coupons for such a cheap rate that it’s well worth spending money to save money. For example, you can buy a $1 off coupon for $0.08. Definitely worth checking out. Both the sites mentioned above will mail you the coupons you buy. Since sending mail isn’t free, there is a small fee to get these coupons mailed to you so make sure you buy enough coupons to make up for the mailing fee. Company’s love it when you give them your email address. If you join their weekly or monthly newsletter, they’ll try to get you to buy their products by sending you deals and coupons via email. Luckily, most companies will also offer you the option of sending you the coupons in the mail. If you don’t see a way to request the coupon in the mail, just send them a polite email asking if they will. Companies love that you care enough to reach out to them so much that most will gladly fulfill your request. A good example of a company offering coupons in the mail to subscribers is Bed Bath & Beyond’s newsletter. Redplum was recently acquired by RetailMeNot and is changing their name to RetailMeNot Everyday. Their coupon inserts and direct mail offers reach over 100 million consumers every week. You’ve likely seen their coupon books and inserts in newspapers all over the country. If, however, you don’t receive newspapers with the Redplum’s coupon book, you can use this coupon finder tool to see if you can receive it for free in the mail. Don’t want to wait for it to come in the mail? You can use the same tool to find out which newspapers in your area include their coupon insert. Proctor & Gamble is a huge corporation that own lots of household brands. You can actually request that P&G send you free samples and coupons in the mail. The process is simple. Select the samples & coupon books you’re interested in receiving. Receive the coupons in the mail! You know what’s better than free coupons in the mail? Free gift cards! Here’s a great article reviewing and ranking 33 different apps that give free gift cards. 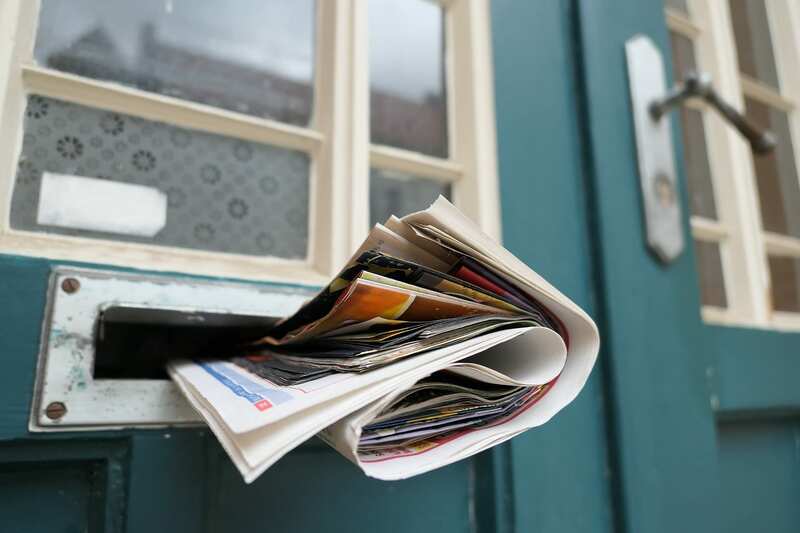 Do you receive any free coupons by postal mail? Any strategies or tips and tricks I haven’t mentioned? I would love to hear about them in the comments! I would like to receive free coupons in the mail. Thank You! I love couponing and safe money if you would send them my way I would preciate it thanks so much..